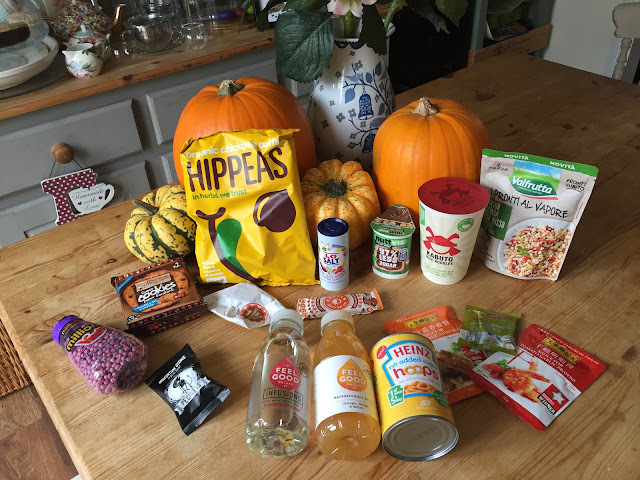 Mrs Bishop's Bakes and Banter: What's in our October Degustabox? What's in our October Degustabox? 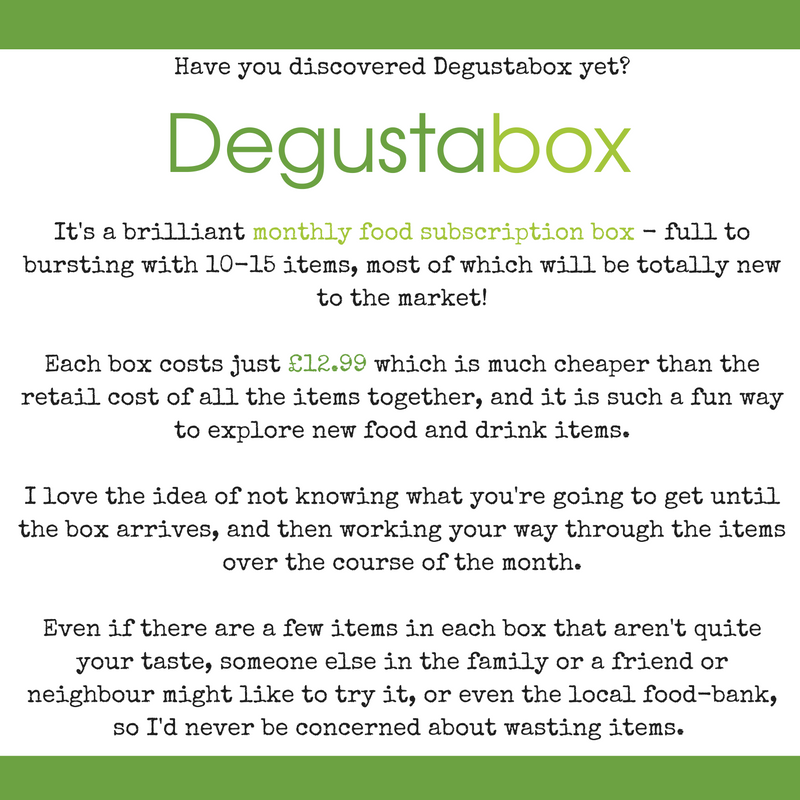 It's that time of the month again where I share the contents of our Degustabox food subscription box - to give you a taste of what you could receive if you try the subscription for yourself. Here's firstly what the brands have to say about the products included in this month's box, followed by what we thought! We believe that if you drink good, you feel good. Feel Good Drinks use 100% natural ingredients only - made from a simple blend of water, fruit and natural flavourings with a refreshing taste. There are three uplifting and complimentary flavours in each of our drinks ranges. It is always nice to try new drinks to the market - especially when they're healthy and not full of sugar. These drinks are a nice alternative to water - if you want something equally as refreshing but with a bit more pizzaz. Love chocolate and hazelnut spread? Small in size but big in flavour, the Nutvia breadsticks snack pack is the ideal sweet treat on the go. Indulge in the deliciousness of hazelnut spread with zero palm oil and 97% less sugar. Perfect in the school lunch box or as a snack, the Nutvia breadsticks taste delicious and can go anywhere you go. I had every intention of giving this to Bert for his school lunchbox, in fact I did send it in with him last week in his lunchbox, but it came home untouched - he hadn't had time to eat it at school. I was secretly pleased, as this was so nostalgic for me - I used to spend my pocket money on 25p Choc Dips when I was a kid, and this seemed to be the newer (much healthier) version. So naturally, I had to give it a try - luckily Bert was in the mood for sharing - so we gobbled it up together and it was super-tasty. Fun for the kids and a little bit messy (why do all kids love mess so much?) - I'd definitely pick these up for the kiddos (and myself) again if I saw them in the supermarket. Be the first in the UK to try one of a new range of tasty ready to eat Mediterranean dishes soon to be available in new packaging; Cous Cous with Mixed Vegetables, Bulgar, Quinoa, Red Rice, Tomatoes and Green Olives, Basmati Rice & Lentils and Spelt with Black Olives, Dried Tomatoes and Capers. 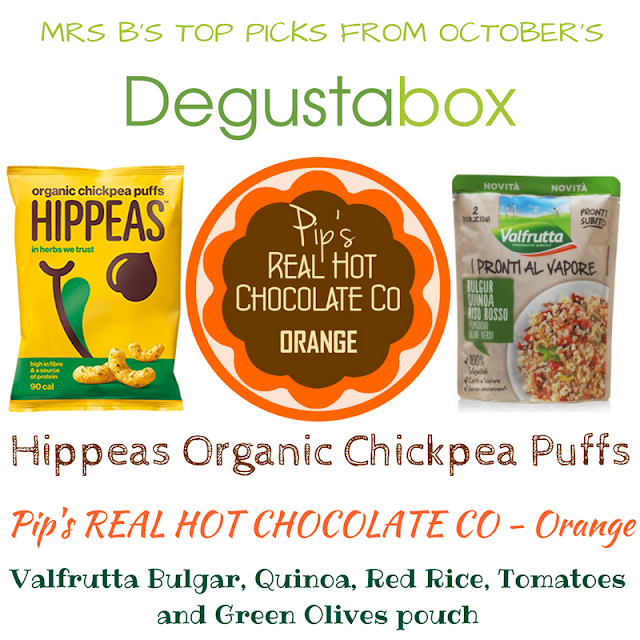 Delicious cold in salads or heat for a tasty meal. Tear open and microwave for one minute or pan heat for 2-3 minutes. SO TASTY! I split the pouch over the course of two days for my lunches when working from home. I cooked them in a pan for 2-3 minutes with rainbow chard and fresh green olives and served it with a cooked chicken breast - it was delicious! Loads of lovely Mediterranean flavours, really filling and wholesome, and the perfect accompaniment to chicken and veggies; plus super-speedy to make, which is a huge winner for me when it comes to managing to eat healthily at lunch times when I'm in a rush. 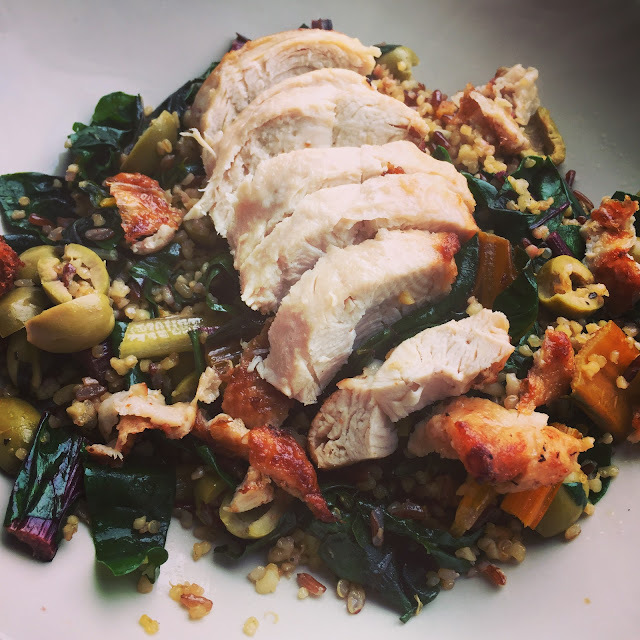 Speedy lunch: Cirio Valfrutta's Bulgar, Quinoa, Red Rice, Tomatoes and Green Olives pouch served with rainbow chard and chicken breast. Real Belgian Chocolate hand moulded by Pip into single servings of hot chocolate then hand-wrapped - flavoured only with natural ingredients. Being nut-free, gluten-free and dairy-free these taste better, feel better in the mouth, and are suitable for almost every diet. There's even ones with no added sugar! 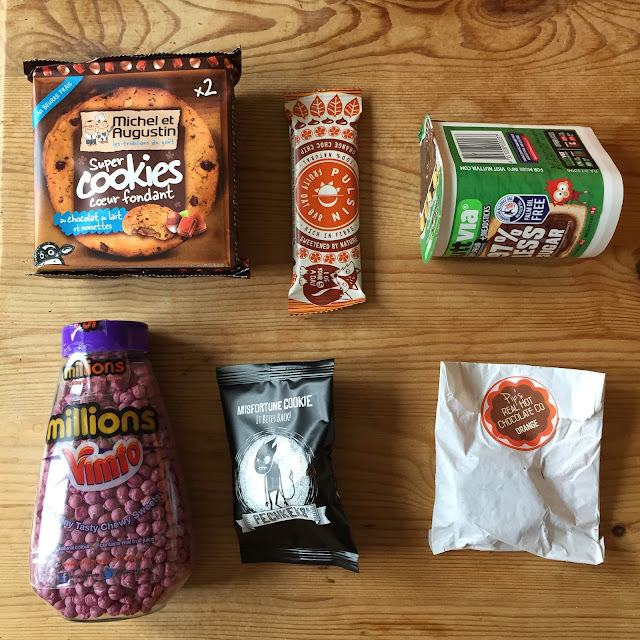 One of my absolutely favourite items from this month's box - my expectations were pretty low for this as I usually find hot chocolate that you make at home to be pretty disappointing - always too milky, powdery, lumpy and lukewarm I'm always left wanting. But this is something else entirely! I used my favourite barista oat milk by Oatly, dropped the coin into the pan of milk, and left it to melt and simmer until it was thick, unctuous and the chocolate-orange aroma was filling my kitchen. I devoured it and was genuinely sad when it ended. It was everything I want from a hot chocolate - thick, super chocolatey, comforting and full of flavour. If you are looking to reduce the salt in your diet, switching to LoSalt is a simple step in the right direction. With 66% less sodium than regular table, sea and rock salts, LoSalt is the healthier alternative for seasoning, cooking and baking, without compromising on flavour. The full size 350g tub of LoSalt can be purchased for £1.75. My mum has used LoSalt for years and swears by it. Personally, I prefer using a sea salt grinder to season as I eat, but I find LoSalt brilliant for seasoning during cooking. Any way I can find to cook in a healthier way is great in my book so I'll definitely continue to use this product. I wish I could say I got to try these cookies - but in reality the kids scoffed them both approximately 3.5 minutes after the Degustabox arrived!! Much like their mother I have children that cannot resist a biscuit/cookie. The radio silence while they were eating them and the empty wrappers and smiling chocolatey faces will confirm that they were delicious - top marks from my 1.5 & 4 year old! Delicious orange choc chip oat bars packed with gluten free UK oats, real fruit and natural ingredients - the ideal snack for kids on the go. Made with 1/3 less sugar than the average kids' fruit snack, they are high in fibre and 1 of a child's 5 a day. Bert took this to school in his lunch box and he said 'Mummy that flapjack bar was really nice!' high praise from Bert indeed. I always feel like doing a victory dance when I've sent him into school with something he deems as a 'treat' but I know is secretly really healthy for him! WIN! Lee Kum Kee sauce sachets offer a wide range of classic Chinese flavours and save you time in the kitchen. We have two from the range for you to try, other flavours include: Sauce for Kung Pan Chicken and Sauce for Broccoli Beef in Oyster Sauce. Sauce for Tomato Garlic Prawns - prepared from tomato, chilli peppers, honey and garlic. Best for stir-frying with prawns, but also great for cooking with meat and vegetables. It can also be used in a sauce mix for salads and as a dressing. Sauce for Honey Garlic Spare Ribs - made with honey and garlic. Best used with meat in stir fries or marinades, but also as a sauce mix or dressing. We haven't yet got round to using these, but the dates on them are great and I feel like they're a really useful thing to have in the cupboard for throwing together a quick and tasty meal with minimum effort. We love oriental food so I'm looking forward to trying them. Our new gluten-free rice noodle dish is inspired by age fragrant green curries from Thailand. They are a delicious combination of Asian inspired flavours and real quality natural ingredients with no additives or preservatives. Ready in minutes they are quick to make and song to savour! Another winner for having stored in the back of the pantry in case of emergencies! I love having a little stock of these instant pot style meals, a true safety net for when we need a meal in a hurry. No Added Sugar Hoops give consumers another great option for mealtimes. With no artificial sweeteners, colours or flavours and 1 of your 5 a day, they are a nutritious and convenient solution for families. 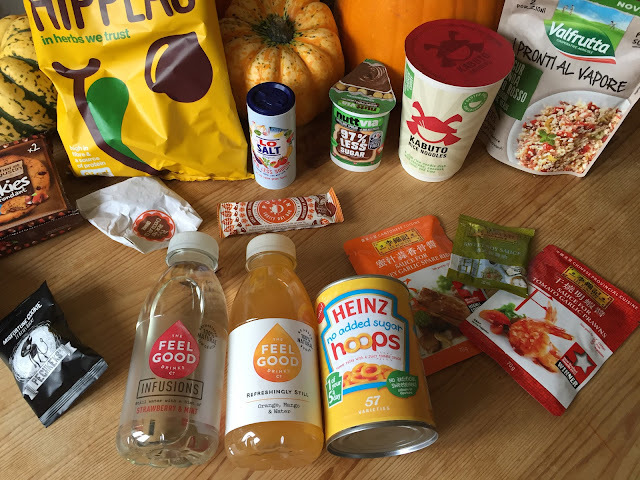 No added sugar - great Heinz taste! Hubby delighted in scoffing these on toast for a nursery-food style reminiscent lunch last weekend. The rest of the family don't really eat them (Bert will not eat anything with a sauce on it!!!) and Connie just spits them out at the moment. I'm really not keen on anything tinned except tomatoes and occasionally baked beans, but hubby reports that they were tasty and reminded him of being 6 again! 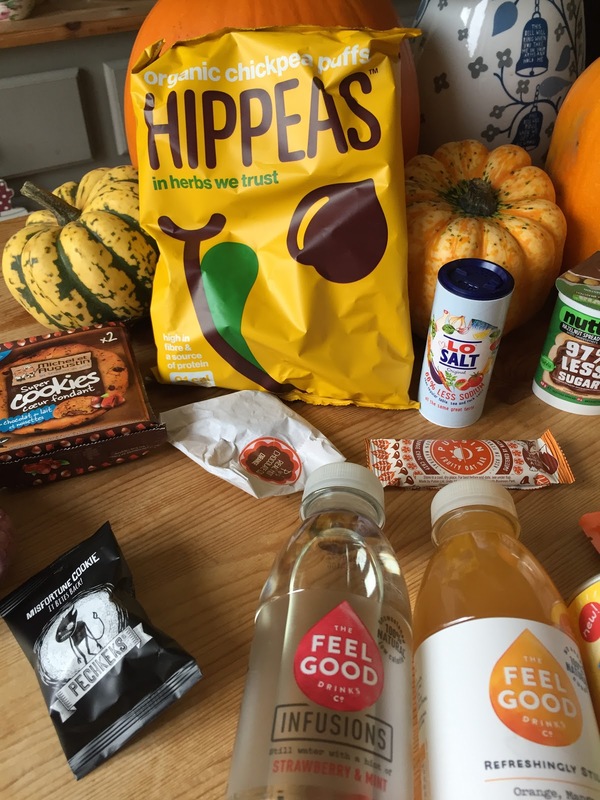 Light, crunchy and airy, but packing a serious punch of protein ad fibre - HIPPEAS is the vegan friendly, on-the-go snack that plans to shake up the global snacking market and spread #PeasAndLove across the world. These were my absolute FAVOURITE item from this months box! We ate the whole giant bag between us the day the box arrived. They're SO moreish!! They taste like a delicious herby pizza sauce and they have great crunch, a lovely texture and are so super filling. They're like a grown up Wotsit with much better flavour and health credentials. Even the kids loved them. As soon as I see them in the supermarket I'll be purchasing again. Black cookies, black humour, ideal for Lucky Likes and Bad-Luck Brians, superwomen and high-flyers, crybabies and wussy wimps, iron ladies and tough guys. We've had the Pechkeks Misfortune Cookies before as hubby won a competition with them a few years ago! They're a very fun idea and would make a great halloween party favour or a fun edition to Halloween dinner party: we gave ours to a friend at Bert's Halloween Party for a 'Best Adult Costume' prize. Millions gets Seriously Mixed Up with Vimto. Vimto Millions are available in a variety of formats, 40g count line, taper jars and a £1 PMP. Millions aren't just unique in shape and size they're known for their fabulously strong., punchy flavours. That's why Vimto's distinctive taste is the perfect fit. I'm slowly working my way through these! I'm not really a sweetie person - favouring chocolate usually - but I do love Vimto - again, a throwback to my 90's childhood...so I had to try them and I love the taste of these little Millions!! No one else in the house is that keen on the Vimto flavour (they must be mad!) so I just tip a few out every now and then for a little sweet treat. I love the robust packaging with a sturdy lid which means you can just a have a few at a time and easy store them in between. 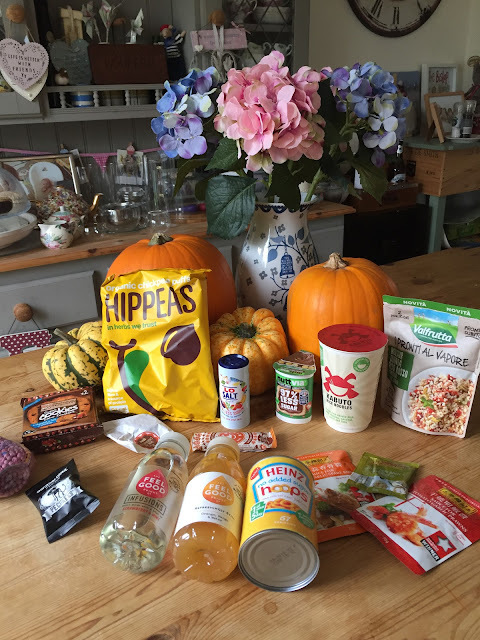 Another corker of a Degustabox this month - containing some brilliant new-to-the-market products, seasonal favourites and some lovely treats for the whole family to enjoy. 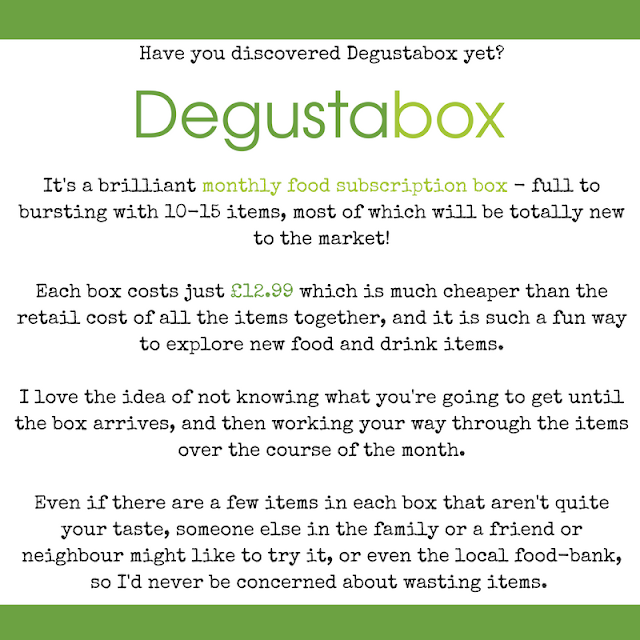 Would you like to give a Degustabox a try? We receive a monthly Degustabox in return for our honest review of the contents.